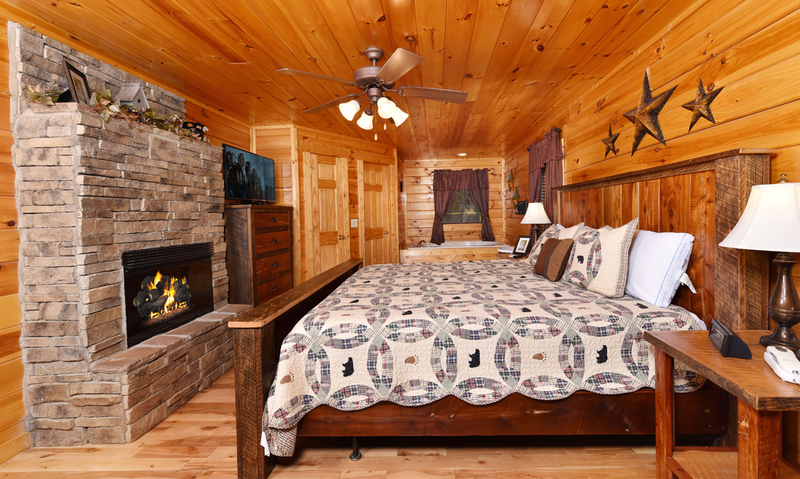 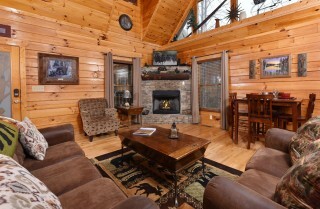 Get that classic Smoky Mountain experience at Bear Hiney Hideaway, with cozy furnishings, inviting stacked-stone fireplaces, a rustic log exterior, a beautiful wood interior, and tree-studded surroundings! 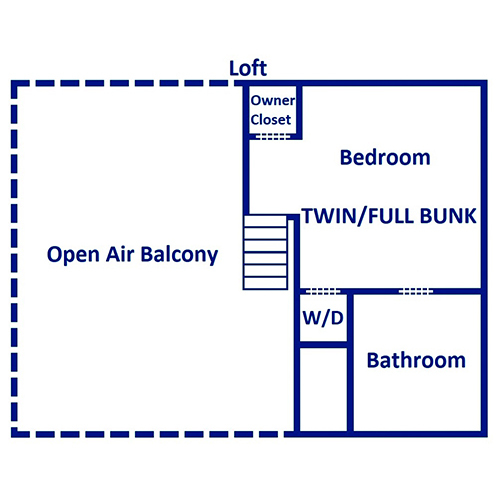 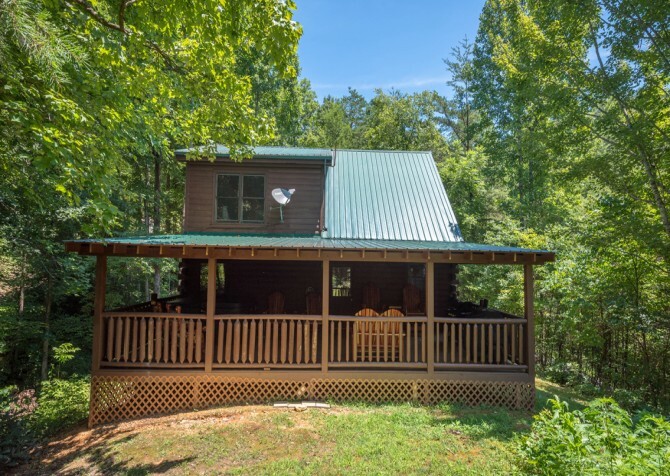 This 1-bedroom + loft, 2-bathroom cabin for 5 is equal parts comfort, fun, and relaxation, perfect for family vacations, weekends with friends, and romantic retreats. 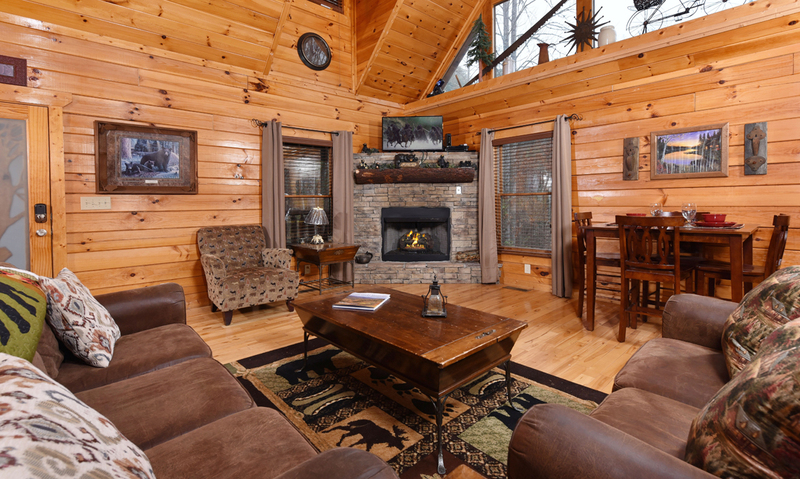 Inside, bust out the board games and hang out in front of the flatscreen TV and fireplace, play arcade games, or sit down for family-style meals at the table for 4. 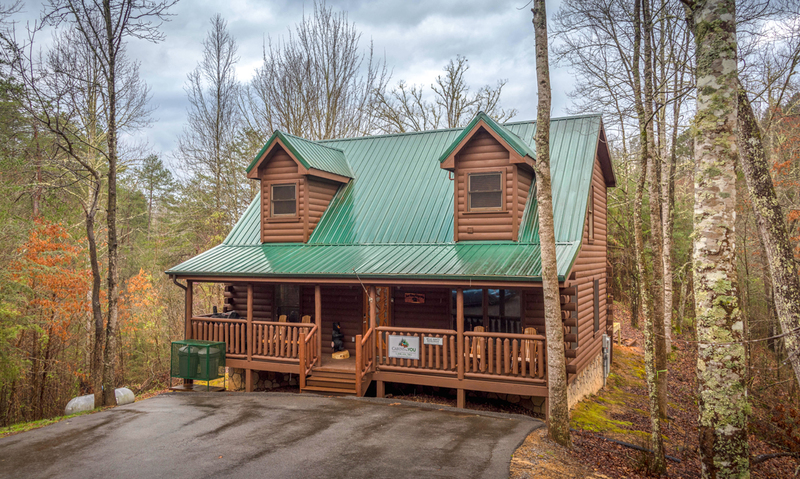 The open kitchen is packed with stainless-steel appliances and the tools you need to make in-cabin meals, while the open floorplan lends itself to good conversation and great times with family and friends. Each bedroom has its own TV, and shared spaces invite you to play, unwind on the cozy couches, or just chat with a drink and some favorite snacks. Outside, Bear Hiney Hideaway keeps giving, with some relaxing spaces to enjoy the fresh air in the Great Smoky Mountains. 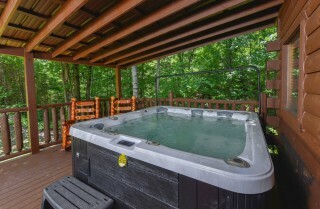 Climb into the outdoor hot tub to soothe sore muscles after a long day hiking in the national park, sip your coffee in the deck chairs before heading into town to play for the day, fire up the charcoal grill for a fun BBQ night, or grab your dinner and sit down at the table for 4 for a nice outdoor meal. Bear Hiney Hideaway also makes you feel right at home, with conveniences like a flat, paved driveway for no-fuss arrivals, an indoor jetted tub for refreshing baths, a DVD player for movie night, and wireless internet so everyone can stay connected! 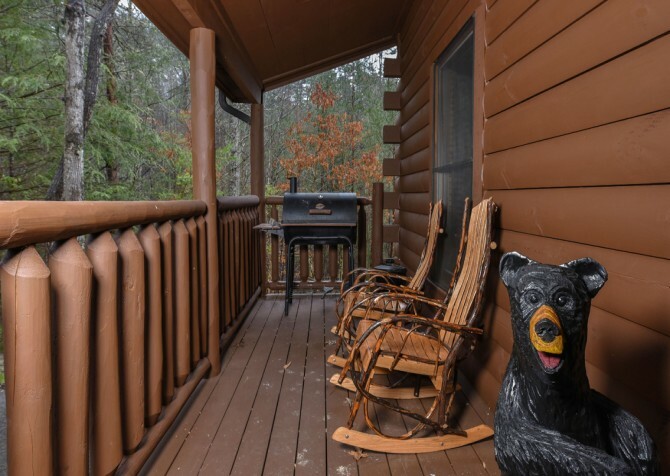 At Bear Hiney Hideaway, you’ll spend your days cozied up on the sofas in front of the stacked-stone fireplace as you hang out or watch TV on the flatscreen. Or you can grab some of the board games you’ll find in the cabin and have a fun family game night around the coffee table as you watch your favorite movies (bring them along for the DVD player) or just relax. 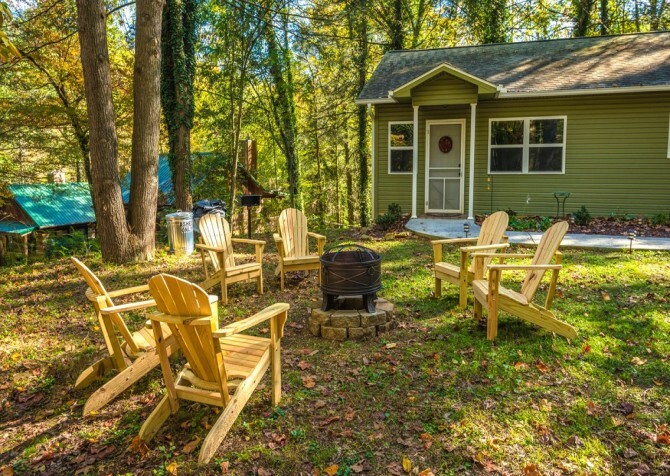 A reading chair with a tabletop lamp is the perfect place – by the fireplace – to crack open that book you’ve been aching to finish. 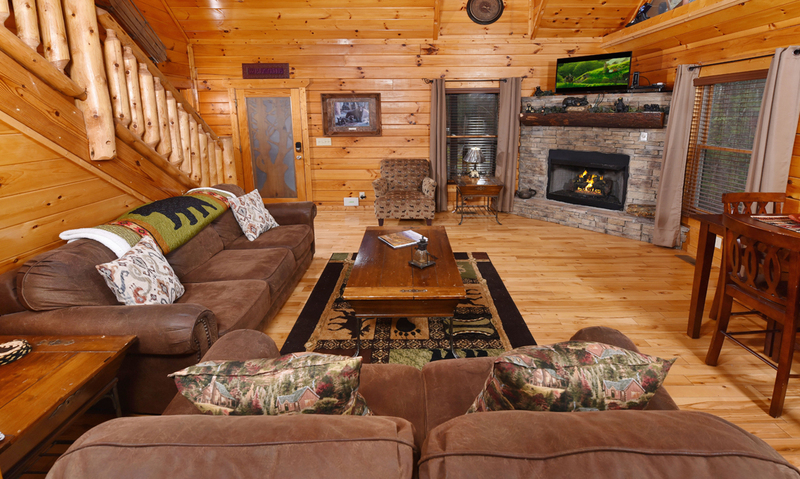 Year-round, this comfortable living room is a great place to gather. Enjoy sunlight streaming in through the large windows and good times with family and friends. 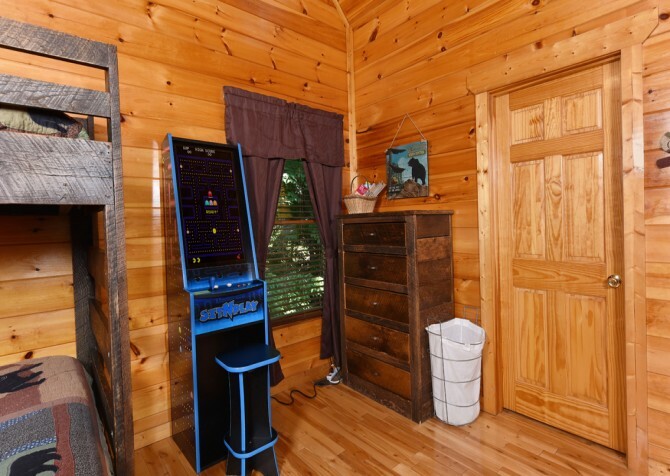 The cabin even has a new arcade game for more fun! When mealtime rolls around, the fully equipped kitchen with stainless-steel appliances will provide what you need for great in-cabin meals. 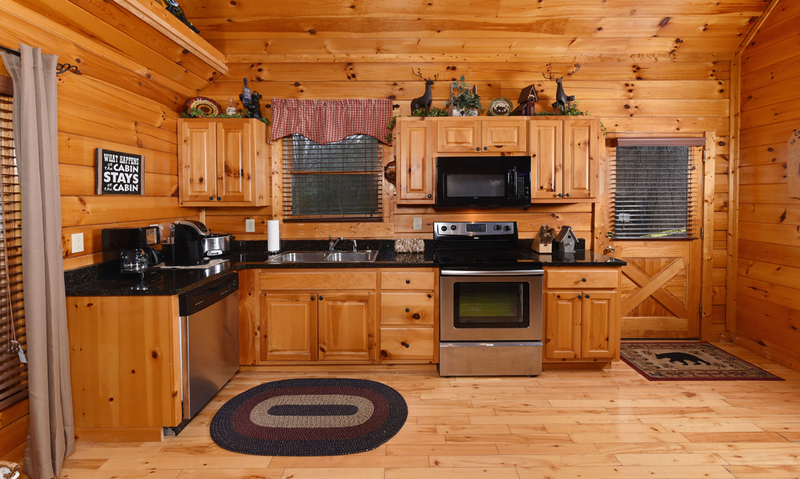 Find enough dishes, glassware, and utensils for your group, along with cooking tools and pots and pans for whipping up your favorite meals. The open-concept floorplan also allows for several people to pitch in when it’s time to feed everyone. 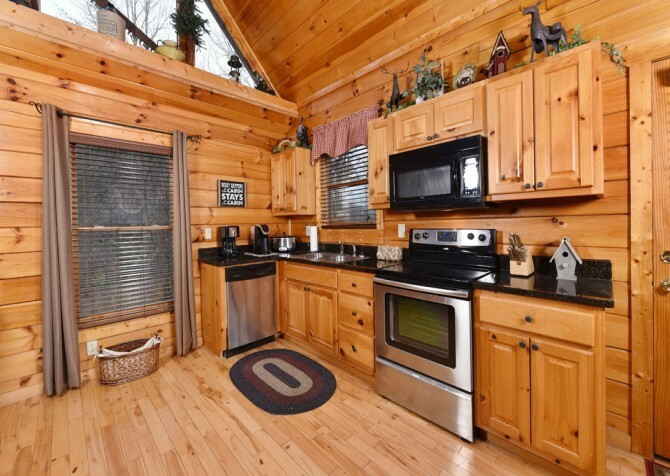 In the morning, head to the kitchen to brew your favorite blend in the Keurig coffeemaker and toss a bagel in the toaster before heading into town. And when you don’t want to cook, downtown Pigeon Forge and Gatlinburg aren’t too far away. 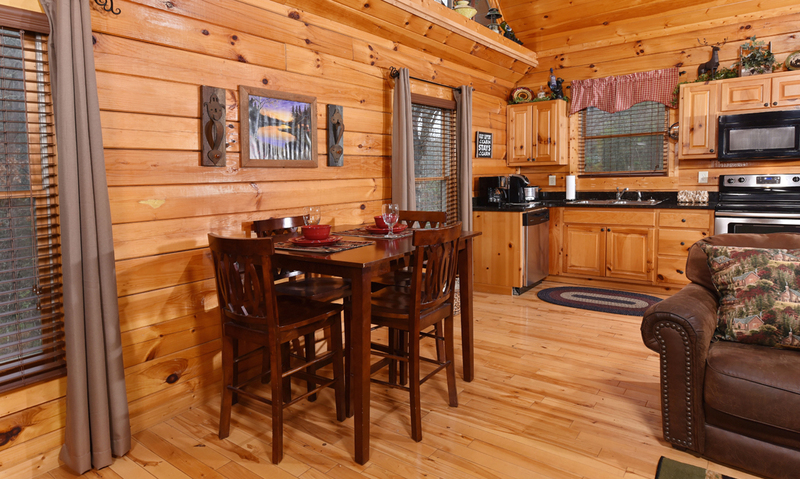 There you’ll find hundreds of options, from quick bites to fine dining options – and everything in between! By the kitchen you’ll find the dining table for 4, perfect for romantic candlelit dinners and nice meals with the family. 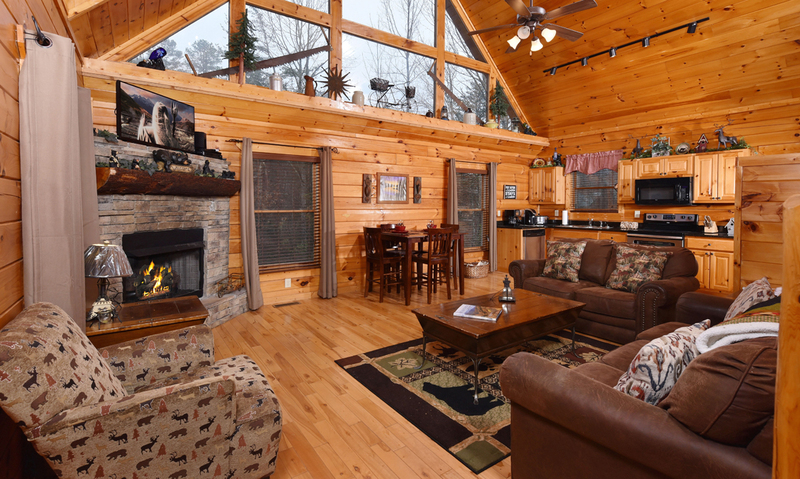 The kids can watch cartoons on the living room’s TV during breakfast, or you can enjoy dinner without missing your favorite show at night. Whether you cook in the cabin, order pizza, or bring back something from downtown, it’s a great spot to enjoy a meal in the comfort and privacy of your own place. 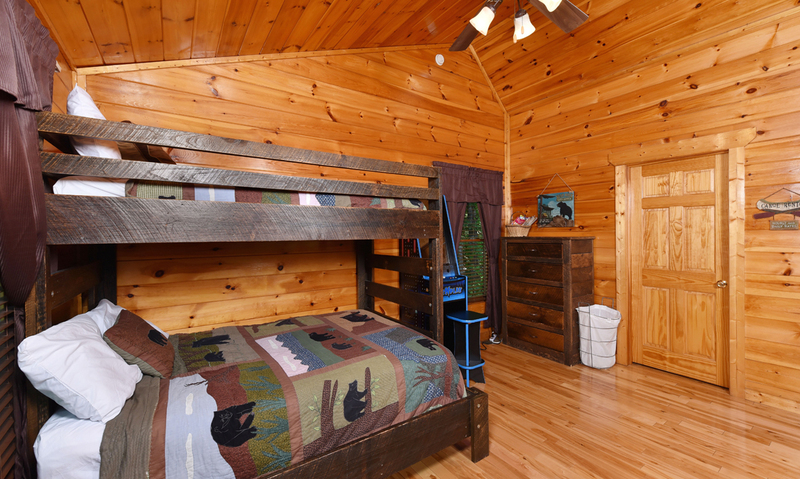 And it’s great for family game night or arts and crafts with the kids! 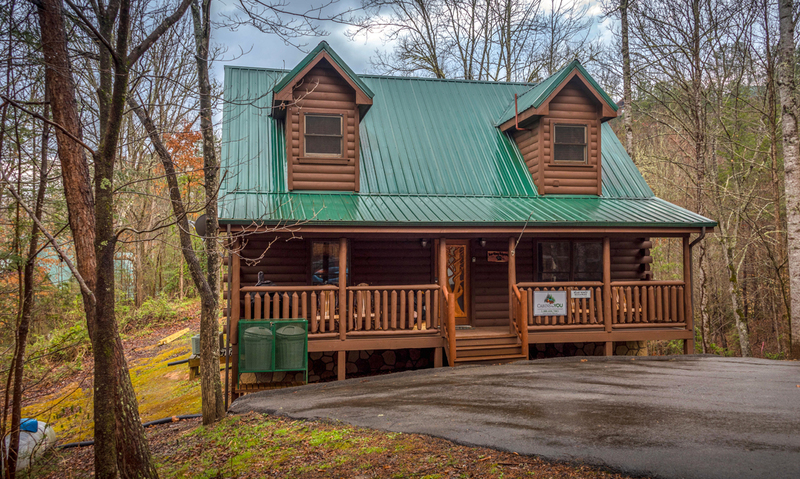 After long days hiking in the Great Smoky Mountains National Park, shopping and exploring at The Island in Pigeon Forge, shopping at the Tanger Outlets, and touring area wineries, the bedrooms in Bear Hiney Hideaway will be welcome retreats. Start with the king-size master suite, complete with its own gorgeous stacked-stone fireplace and jetted tub. A rustic dresser gives you space to unpack, and a flatscreen TV lets you watch your favorite shows without sharing the remote. In the loft, the second bedroom features a twin-over-full bunk bed that’s great for letting kids have their own space or for families wanting to stay in the same space. Another rustic dresser gives more space for unpacking, and another flatscreen TV is here as well. 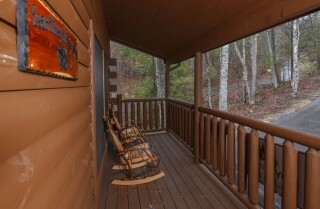 What would a getaway to the Great Smoky Mountains be without some time spent in the great outdoors? At Bear Hiney Hideaway, you’ll find several great place to unwind and breathe in that fresh mountain air. 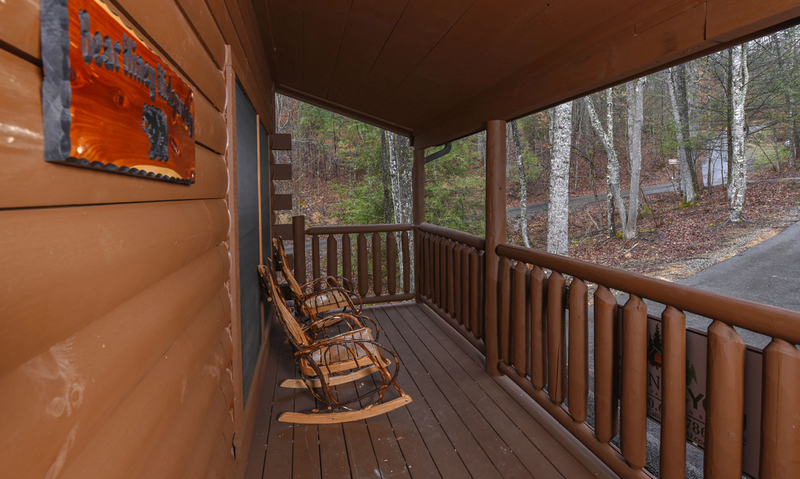 On the front porch, make yourself at home in the rustic log rocking chairs. Grab a cup of coffee in the morning or a glass of Ole Smoky Moonshine in the evenings and enjoy some peace among the trees. 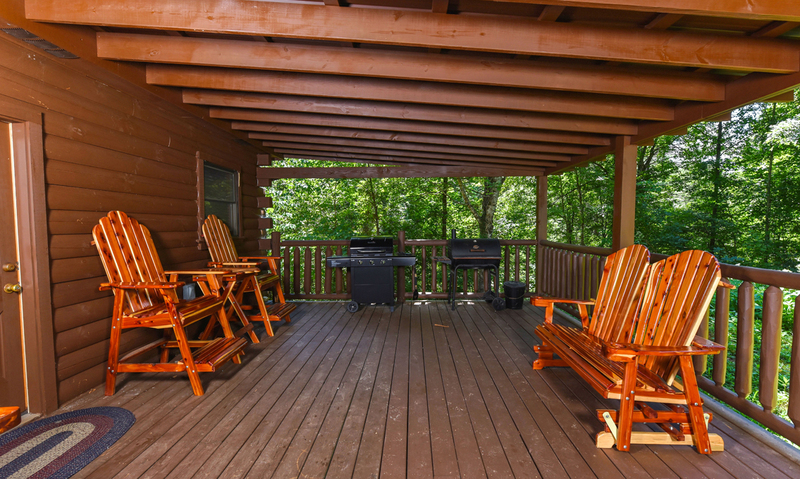 On nice days, fire up the charcoal grill to toss on some burgers, steaks, or kabobs. 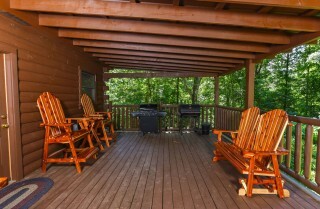 Enjoy the smell of the grill as you sit back in the rocking chairs and soak up some fresh air. 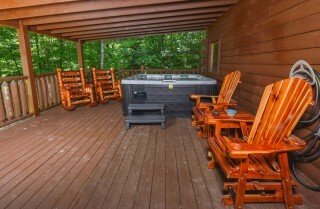 Then head to the back deck to unwind in the hot tub before you call it a night. The hot, bubbling waters will help those stresses just melt away – with the trees all around. Not too far from Pigeon Forge or Gatlinburg, Bear Hiney Hideaway makes it easy to explore the area. 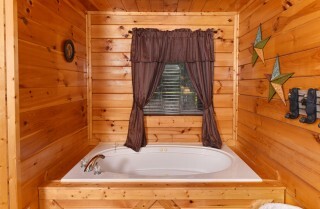 From romantic spots for couples to family-friendly attractions to group-centered fun, there is something for everyone. Spend days riding roller coasters at Dollywood, keeping cool in summer at Dollywood’s Splash Country, trying to break free at The Escape Game Pigeon Forge, listening to live music and sipping moonshine at the Ole Smoky Moonshine stage, and strolling along the Parkway. 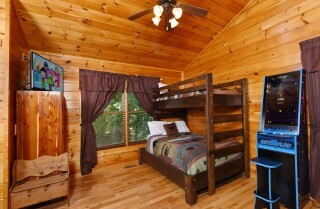 And don’t forget laser tag, go karts, outlet shopping, fresh fudge, miniature golf, and unique attractions! 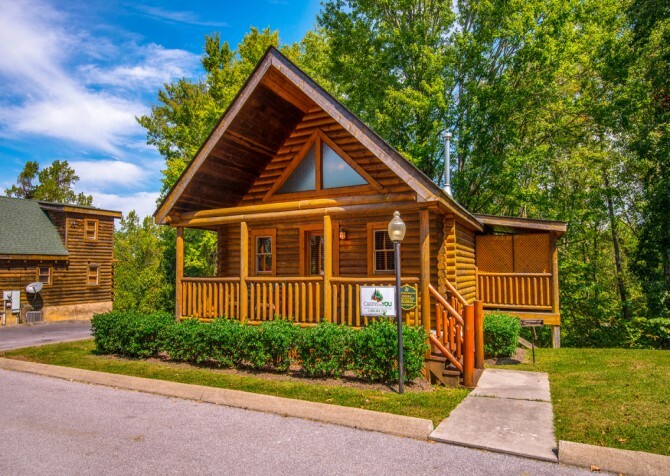 Test your skills as you attempt to break out of prison, stop a heist, and more at The Escape Game Pigeon Forge. 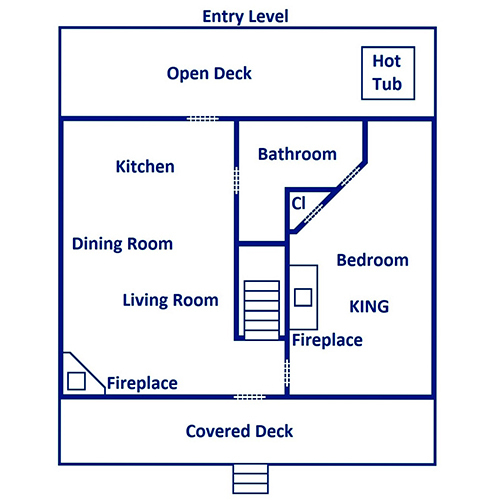 You’ll decipher, decode, and figure out puzzles to get out in under an hour – a great group activity! 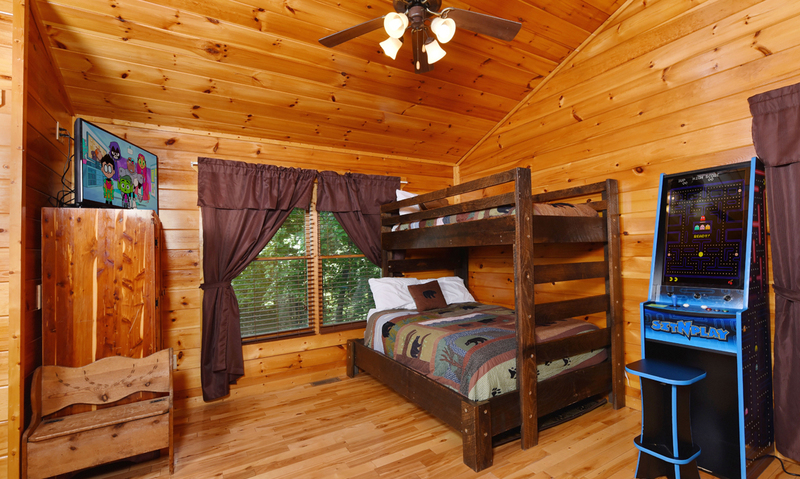 Race against family and friends with go karts on The Track in Pigeon Forge, or check out mini golf and kids’ rides! The littles will love the carousel, and the whole family can join the fun in the arcade! 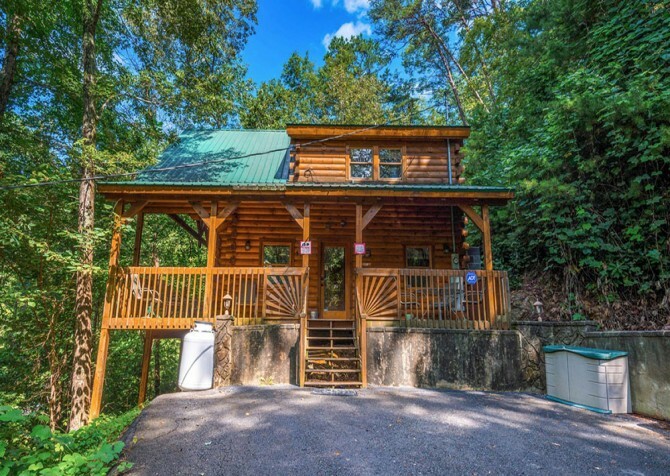 A historic landmark in Pigeon Forge, The Old Mill is more than just a mill. 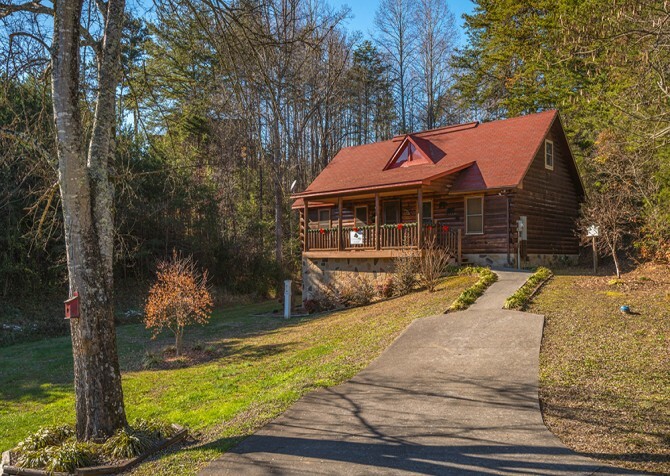 The still-working mill is just part of this awesome spot, where you’ll also find homemade ice cream, old-fashioned candies, shopping, and delicious food! 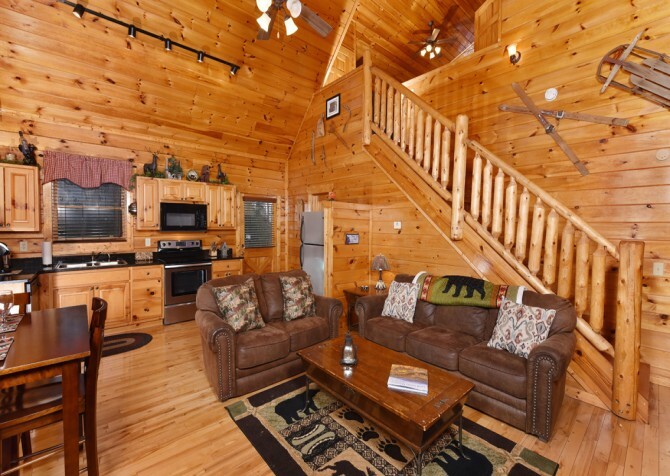 "Such an amazing cabin to enjoy with friends and family. The huge deck is the perfect place to start your day with a cup of coffee or to enjoy the hot tub at the end of your day. Cabin is private,clean and just minutes away…"
"Such an amazing cabin to enjoy with friends and family. 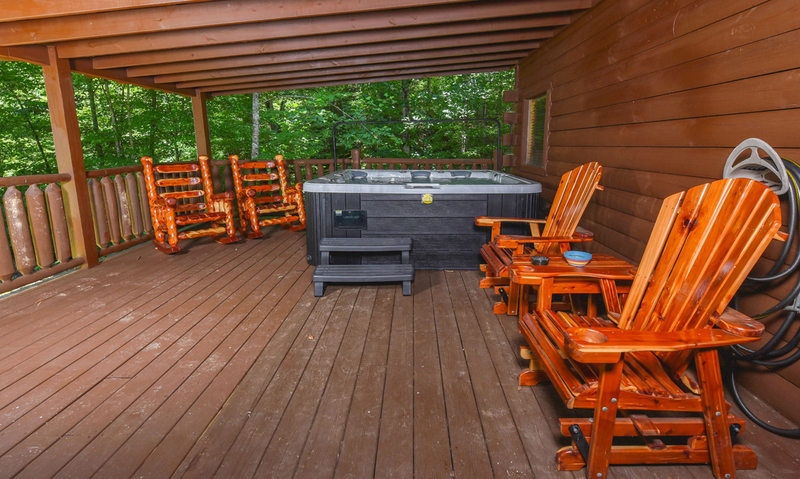 The huge deck is the perfect place to start your day with a cup of coffee or to enjoy the hot tub at the end of your day. 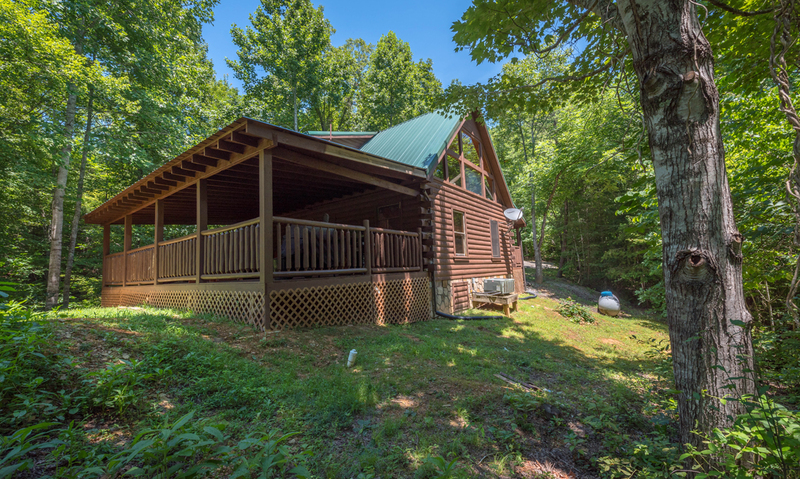 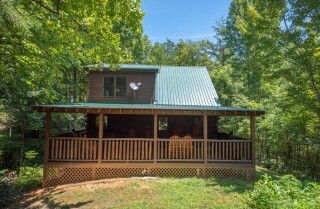 Cabin is private,clean and just minutes away from everything! It doesn’t get much better then this. 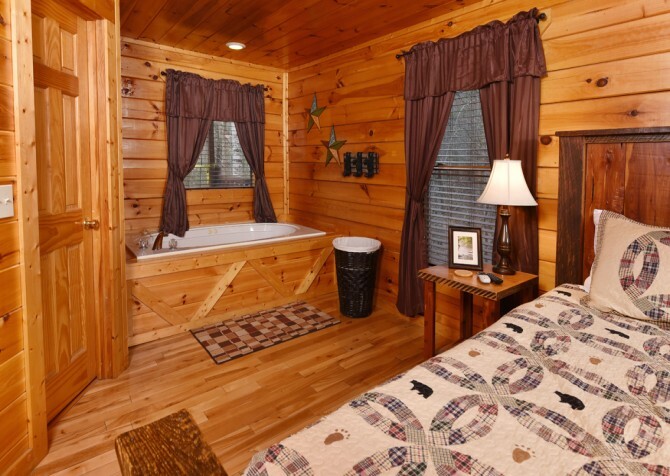 I highly recommend this cabin it won’t disappoint!" 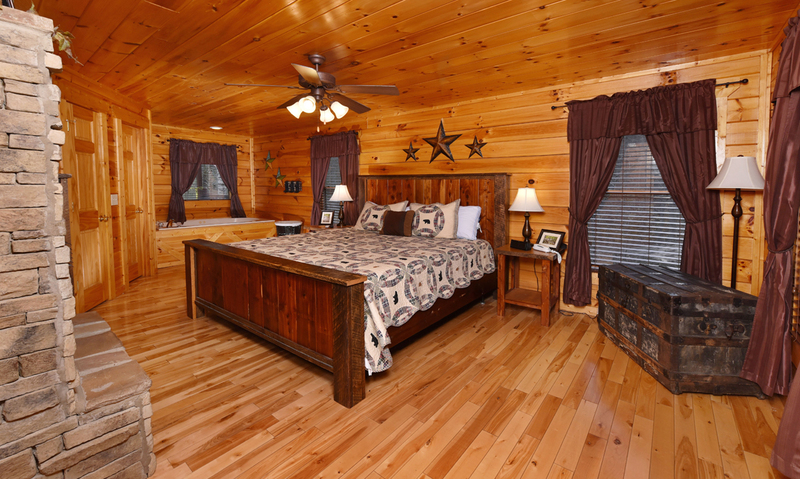 Thank you so much for the raving review! We are so glad to hear that you enjoyed the cabin during the mornings and evenings. We are really excited to have you stay with us again in the future!